Steiner Optics 6502 T824 8x24 Tactical Binoculars - Model 6502 FREE SHIPPING! A company born from the rubble of post-WWII Germany, Karl Steiner sought to create a company specializing in high-caliber optics that was unmatched in the realms of mass-production. 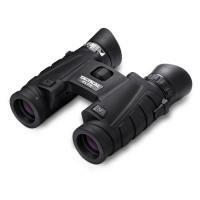 Constructed for combat performance, the T824 tactical binoculars are known for their lightweight durability. The multi-coated, HD lens provides 8x magnification at 24 mm, capturing more light to ensure images are clear and focused even in low-light settings. Its center wheel utilizes Fast-Close-Focus™ technology, allowing for quick focusing with little rotation effort. The N2 injection™ system locks dry nitrogen in the optic chamber for fogproof viewing in all weather and climate conditions. Steiner's rubberized ergonomic body offers shock resistance and waterproof protection up to 6' submersion. With their trademark, ClicLoc® system users are granted instant click-release of the neck strap, or harness, for quick viewing action. Steiner binoculars are the ideal compact companion for outdoor enthusiasts--from hunting, bird watching, backpacking and other near to mid-range recreational activities. Dimensions (H x W): 4.2" x 4.8"
©2002-2019 CopsPlus.com: Steiner Optics 6502 T824 8x24 Tactical Binoculars - Model 6502 FREE SHIPPING!